"Hey, Artie? Supreme executive power derives from a mandate from the masses, not from some farcical aquatic ceremony." As a tale already covered in numerous earlier incarnations (the best arguably being John Boorman's 1981 version, "Excalibur"), Antoine Fuqua's "King Arthur" (IMDb listing) attempts to breakdown the legend and demystify the story of Arthur, Guinevere and Lancelot. As explained in the opening moments, this "Arthur" isn't about magic, romance and grandeur; this take is supposed to be gritty, polluted, and rooted deep in authentic flavors of the era, set 1,000 years ago. Maybe that's why it's such a bore. Yes, the round table is here. Excalibur too. But what Fuqua ("Training Day," "Tears of the Sun") is going after is taking the fanciful tale away from blinding silver suits of armor and melodramatic tales of romantic betrayals. His "Arthur" is a story told in the misty and snowy mountains of Britain, a land caked in mud and rain, and ruled by many. Arthur's enemy here is not his heart or trust, but the Saxons, lead by the evil Cerdic (an easy, toothless performance by Stellan Skarsgard). Guinevere (played by "Pirates of the Caribbean" breakout star, Keira Knightley) is not a damsel in distress, but a fierce warrior, from a tribe of people called the Woads, who assists Merlin (Stephen Dillane) in combating all who try to take control of their land. And Lancelot (Ioan Gruffudd) is not a man ruled by his desires, but by his allegiance to Arthur and a yearning to end his warrior days. All this is possibly within striking distance to the "real story" of Arthur, but that doesn't make it an interesting experience to sit through. "Arthur" is a clumsy movie, persistent in its attempts to keep the audience awake with extravagant and outlandish battle sequences, only to lull them back to sleep with a story that desperately lacks passion and awe. The idea is there to turn this famous tale on its ear and explore the reality of the era, but the execution is haphazard at best and, most criminally, the movie is unexpectedly dull. The one element that I believe Fuqua does get right is the camaraderie between Arthur and his Knights of the Round Table. Earlier productions often tossed this crucial subplot aside to focus on the romantic triangle formed by the three main characters. This "Arthur" doesn't bother much with love, opting instead to spend a good amount of time observing the bonds these men share, along with their frustrations with the land, and their undying respect for Arthur. Because the bond is so carefully attended to, the battle scenes, which pop up every 30 minutes, are that much stronger knowing the lengths these characters will go to protect one another. Unfortunately, that's all the battle scenes have in their favor. "King Arthur" is a victim of both mismanagement in the editing room and a poor release date. The medieval sword and arrow show on display here might have had a fighting chance of capturing the audiences' imagination had this film not come out within a year of "Return of the King," or right on the heels of "Troy." The three films share the same blueprint of war coverage, with "Arthur" coming third in this race due to the widely known last minute tinkering to get this clearly visceral, R-rated film down to an investors-pleasing PG-13. Fuqua has already elected to cover his action with confusing fast cuts and useless open-shutter photography (like many, many directors before him in recent years), but now the film is bloodless too, directly contradicting the film's intent to keep the story authentic. The new cuts to the violence only make the old cuts more chaotic, making Arthur's final battle against the evil Saxons, which takes up the last third of the picture (! ), a raging mess. 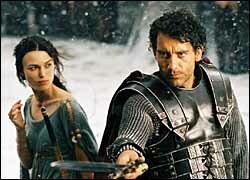 The film eventually hinges on the commanding leadership of Arthur, and actor Clive Owen fills those boots accordingly. It isn't an incredible performance by any means, but he's not letting the film down; the picture has already done that on its own. What's even more curious is the film's marketing angle, which places central focus on Keira Knightley, yet it takes the picture an hour to get to her, then pushes the actress into the background for the rest of the show. Fuqua bungles Guinevere's dramatic arc badly, instructing Knightley to make abstract, flirtatious eye contact with Gruffudd, hinting at the mythic love triangle to come (it never does), which is the cornerstone of this fable. Didn't we just spend 120 minutes trying to erase those thoughts? Maybe Fuqua got cold feet at the last minute trying to keep away from the legendary aspects of the tale. After dealing with muddy landscapes (well photographed by Slawomir Idziak) and a drama drained of its life force, I can't blame him. If I had to choose between the truth and the myth, the myth is always the better way to go. Behold Excalibur on your wall! Buy a King Arthur poster.